Oxygen is vital to all living organisms. Low oxygen concentrations can cause koi to be susceptible to disease and even die suddenly. Usually the larger koi die first when the oxygen level is too low. Oxygen concentration decreases when, (1) temperature increases, (2) over stocking of koi in your pond, (3) decaying matters in the pond, (4) poor or no circulation of pond water. Moving water helps mix air into the water. A stream, waterfall and jets can perform this. By moving the water surface of a pond with water jets, the atmosphere and water contacting each other repeatedly will increase the oxygen content of the water. Air pump and air stone/air diffuser ring is a good means of increasing oxygen concentration. By increasing the oxygen level in the pond water a healthier pond is achieved. One important aspect that higher level of oxygen in a pond helps is in better promotion of good biological bacteria known as Aerobic bacteria. Aerobic bacteria are the good bacteria in our pond that need and like oxygen. They grow and eat dead decaying plants and algae 20 to 30 times faster than Anaerobic bacteria. Anaerobic bacteria live and grow in the absence of oxygen. Maintaining a constant supply of oxygen greatly improves the ability for the Aerobic bacteria to thrive and keep your pond cleaner, the water clearer and fish healthier. Ponds that are designed with bottom drains permit better oxygen disbursement towards the bottom as water usually enters the pond's top surface and is drawn out from the bottom drain to the filter box. This method re-circulates the pond's total water volume better. More oxygen content close to the bottom promotes the good bacteria which consumes waste that settles on the bottom. There are many benefits to having adequate oxygen concentration. So, when it comes to oxygen in your pond, more is better! Efficient biological filtration enables Koi to live in a pond. Without it, the pond would quickly become impossible to live in due to the build-up of toxic ammonia from koi wastes. In the nitrogen cycle, waste matters (urine and waste discharge from koi, unfinished koi food) are mineralized into Ammonia and Ammonium. This is then oxidized by bacteria into Nitride (NO2). In turn, this Nitride is further broken down into the relatively harmless Nitrade (NO3) which is removed during regular partial water changes. The beneficial filter bacteria (the biomass) occur naturally in air and water, but, to colonize the filter and multiply to viable levels, they require nourishment in the form of koi waste discharge and unfinished koi food, etc and very importantly together with a constant supply of dissolved oxygen, and time. Chorine in tap water is lethal to filter bacteria. Ensure the pond water pH is between 7.2 and 7.8 and that there are no residual contaminants like lime from untreated mortar. If your pond is fiber-lined this becomes less of an issue. Take note that bacteria will not grow if the pH is lower than 6.5 and that the higher the pH, e.g. pH at 8.2, ammonia becomes a lot more toxic compared to pH of 7.2 and could well kill the koi in your pond. Aeration of the water would provide a better environment for bacteria growth but at this stage keep the UV light switched off. To kick-start having bacteria in the filter chambers, add a liquid suspension of live filter bacteria into the biological filter chambers. Close monitoring of the various water parameters like pH and dissolved oxygen level would be required. When koi is finally introduced to the pond, ammonia level is the next parameter you need to pay particular attention. It would be necessary to turn on the overflow water supply tap to allow a constant drip of fresh water to the pond which would in turn drain off water via the discharge pipe. It can take several weeks for the pond to achieve the required biological balance to allow your koi to live in it safely. With proper planning and execution you should get there. Enjoy your new hobby and take good care of your Koi. From time to time, your well-kept koi collection perished due to lack of oxygen for several hours when your water pumps stopped during a power failure. You are able to continue a steady supply of oxygen to your pond if you have an air pump supported by an AC back-up set and a battery. With an air pump, your pond will have a regular supply of oxygen. It becomes even more important during a power failure as this supply of oxygen continues for another 5 to 8 hours as the AC back-up automatically kicks in. This is a 'must-have' if you experience frequent power disruptions at your place! The AC back-up set allows for re-charging of the battery when electricity supply is restored. 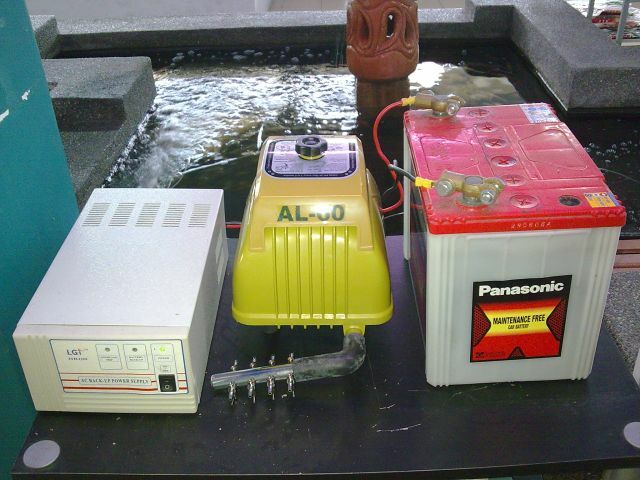 To avoid being caught with a flat battery and also to enable the battery's life to last longer it is recommended that the battery is completely drained off at least once in two months by cutting off the electricity supply. Remember to switch on the supply after the battery is completely flat to allow re-charging.